Charles Edward Louis John Casimir Silverster Seerino Maria Stuart is better known to history as 'Bonnie Prince Charlie.' In the year of 1745 Charles set sail for France to capture the throne of England for the deposed house of Stuart. It was a gamble at long odds, for Charles sailed with few companions and faced uncertain reception in the Highlands of Scotland. But the events that follow became the stuff of legend as Charles and his army of Highlanders overran Scotland and marched to London. A French naval force failed to invade and Charles was forced to retreat to Scotland. In the following year the bloody Battle of Culloden smashed the clans and ended the Jacobite Rebellion. After many adventures Charles returned to France and the legend of the '45 was born. The '45 models the campaign in Britain and allows players to command the Jacobite Army against the forced of the Hannoverian Government. 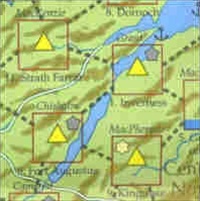 The game features an accurate order of battle for the armies. Players will handle the actual forces that fought or could have fought in the campaign. 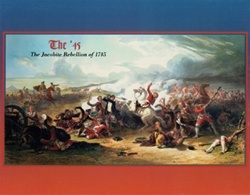 The game features scenarios that allow players to examine the campaign at six important turning points, plus a campaign game covering the entire period. The unit scale is regimental with detached companies and squadrons of ships. The map scale is point to point movement on march or 20 miles average. Components: 352 large (5/8") counters, 24 page rulebook, three player aid cards, and a 22x34" mapsheet, 1 inch box.